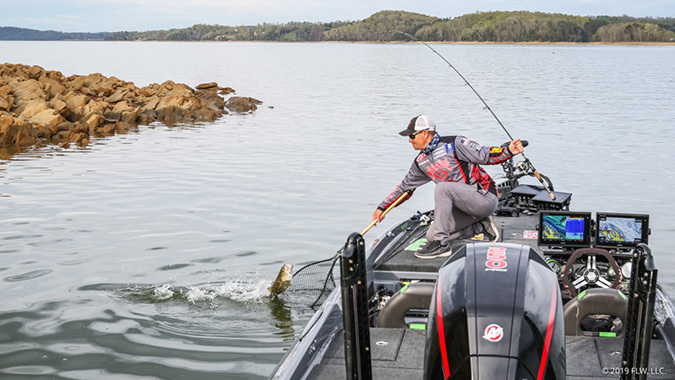 JEFFERSON CITY, TN – Pro Andrew Upshaw of Tulsa, Oklahoma, is still on top at the FLW Tour at the Cherokee Lake presented by Lowrance after catching five bass weighing 17 pounds, 14 ounces. Upshaw’s two-day total of 36-4 will lead the final 30 pros into the third day of the event, with pro Dylan Hays of El Dorado, Arkansas, in second with 34-8 and Lowrance pro Austin Felix of Eden Prairie, Minnesota, right on his heels in third with 34-5. With weights this close together, there is sure to be some movement on the leaderboard heading into Championship Sunday, when the final 10 pros will take the water with their sights set on the top award of up to $125,000. Hensley Powell of Whitwell, Tennessee, earned the $500 Big Bass award Friday after bringing a bass to the scale weighing 5 pounds even - the heaviest fish of the day.